I use a Thinkpad T43, and I love it. Along with other Thinkpads and IBM keyboards, it has a couple little keys above the arrow keys that go “back” and “forward” in your browser. At least, in Windows IE. Shockingly, they don’t work with Firefox (in Linux) out of the box. Update: Rob Mayoff’s howto, originally for Mozilla, now includes Firefox. He’s done most of the work in a package that you can install with a single click. 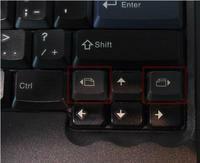 If you just want your thinkpad keys to work already, follow his howto. If you weren’t working in your firefox/chrome directory, copy the new browser.jar over the existing one in firefox/chrome. Restart Firefox, and you should be set! If not, feel free to email me, and I’ll try to help. thanks to Mike Baas for pointing out some errant slashes left over from the migration from snipsnap to pyblosxom. they’re fixed now. Just want to say a big THANK YOU for your article. works on my R40, too. greatly appreciate. Thanks a lot. I’ve been trying to install Rob Mayoff’s fix but have been unsuccessful. However, after a little editing, I’m happily using the keys on my IBM T42 again! Worked for me on the X61 tablet too. I know this is propably not the best place to ask, but maybe someone knows how to (in Firefox running under winxp) reassign the Back and Forward keys to Previous Tab and Next Tab? I tried keyconfig extension but it doesn’t catch the keys. Right now I have assigned Ctrl+Alt+L/R-arrows and it works but the special Thinkpad keys would’ve been more useful to me, because I surf using tabs, and rarely use Back and almost never Forward. But thanks anyway for the lead. also i got a t43p, and it s awesome…thank you for this little trick! I still have a few keys and buttons on my Thinkpad X220-tablet that are not operational under Linux but that work well under that other OS. I’ve heard that there is a low-level register when one might mask bits to enable-disable various keys and buttons and ACPI features. Can you shed any light on this? Can you direct me to where I might find more information — without reading the kernel code?